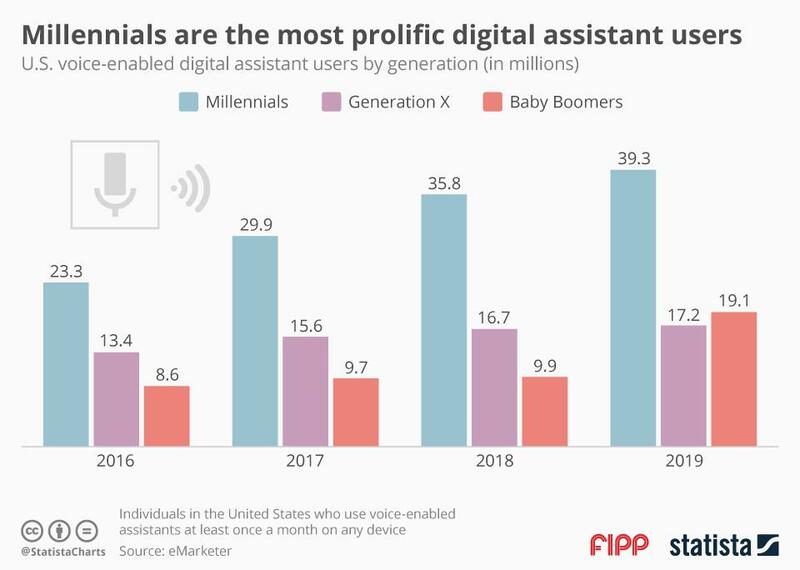 Chart of the week: Millennials are the most prolific digital assistant users They haven't had their big-time breakthrough yet. Still, digital voice assistants - such as Amazon’s Alexa, Apple’s Siri, Google Now and Microsoft’s Cortana - are on the rise. The generation fastest taking a liking to the digital servants are Millennials (born between 1981 and 2000). This isn't all that surprising, as most of them are digital natives. However, the gap to the next youngest generation, the Generation X (born 1965 to 1980) will keep on widening, as their pace of adoption will likely lag behind that of the Millennials, according to predictions made by eMarketer (https://www.emarketer.com/Article/Alexa-Say-What-Voice-Enabled-Speaker-Usage-Grow-Nearly-130-This-Year/1015812). While the number of Millennial users is likely to jump 16 percentage points from 23.3 in 2016 to 39.3 per cent in 2019, the Xers could possibly leap a mere 3.8 points in the same time period.